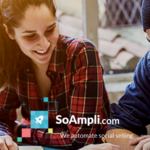 Employee engagement strategies, corporate messaging platforms, new generations at work, Enterprise Social Networks, the rising role of social media. The number of trends and discussions internal communication professionals need to be aware of is constantly growing. In this fascinating landscape, Rachel Miller has become something of a household name in the industry. After beginning her career as a journalist and working in corporate comms for a decade (including in-house positions at Visa, Novartis, London Overground Rail Operations, Visteon & Tube Lines), in 2013 she launched her own consultancy, All Things IC. Thanks to her work coaching, advising and encouraging professional communicators as an independent consultant, Rachel was recently named Outstanding Independent Practitioner by the Chartered Institute of Public Relations’ Excellence Awards. We had the pleasure to sit down with Rachel to discuss the beginning of her thought leadership journey, what the key business benefits of building a strong personal brand are and how companies can (or should?) encourage their employees to be on social media. Q: With a strong social media presence and a must-read blog for all internal comms professionals, it is fair to say that you are a thought leader in your industry. How did it all start? Thank you, that’s very kind. I created my blog in 2009 while working full-time in the railway as a professional communicator and simultaneously studying for a post-graduate diploma in Internal Communication Management at Kingston Uni. I started to research social media’s potential role for internal communication in 2008 as part of my studies. From everything I’d read, I realised it was an area professional communicators would need to understand, so I started working out loud (before I knew it was called that) and learning as much as I could. I’d been using LinkedIn for a while and starting to build my network, but it wasn’t until I started tweeting in January 2009, then sharing my thoughts via my blog a few months later, that I realised the benefits first-hand. Not only to help with my studies, but to connect me with some awesome communicators around the globe. I blog about internal communication, social media and PR. In January 2017, I published my 1000th post and can’t quite believe I’ve written 768,000 words! The site’s original purpose was to give my views and provide a space to document what I discovered. Its purpose remains largely the same, but hearing from readers and featuring their views as guest posts has been an important evolution. 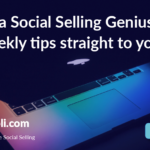 Q: How is having a strong personal brand and utilising social selling helping your business? My business works because social interaction is at the heart of it. I believe you gain more when you give, and have built my company model around that openness of communication. All Things IC consultancy is steeped in social, it’s the way I do business, which is why I take the time to invest in it. The name was my Twitter handle, @AllthingsIC, which I’d changed when I got married in 2010. 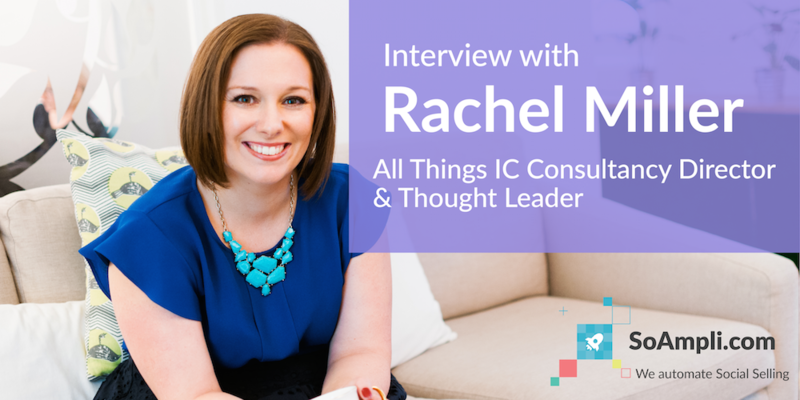 When I launched the company in 2013, people had been referring to me for a couple of years as “Rachel Miller of All Things IC,” even though I had been working in-house. So, it made sense to brand everything I was doing under the same name when I launched. A medium is only social if it allows for interaction, and that’s the way I work, by being open to communicating and responding. My website is the shop window for my consultancy. Blogging and being visible via social media has built my network and means every client I’ve ever worked with has approached me directly and asked for my help. This means I don’t pitch for work and have the pleasure of working with some incredible companies, from a one-day to longer-term partnership. I regularly ask new clients what made them get in touch, and you can’t beat hearing feedback like: “Rachel I’ve read your blog for years, I know how you think, how you work and what’s important to you. So I know you’re the person I want to hire to help me.” It’s comments like that which make every late-night blogging or planning session worthwhile! Q: What are 3 pieces of advice you would give to someone who wants to start using social media to build their personal brand? Do your thinking first. If considering using social media to build your personal brand, you need to do the thinking before the doing. In other words, what are you trying to communicate? Channel choice aside, you need to be clear about your personal brand and what you want people to think, feel and do as a result of your interactions. Choose wisely. Part of building your personal brand is choosing the right platforms for you. You need to join and start conversations, so do your homework into the communities you are trying to reach – where are they communicating? How can you get involved and help shape conversations? What will add the most value not only to yourself, but your clients and network? Think quality over quantity. Far better to have 50 Twitter followers who are the people you’re trying to reach and have active relationships with them, than 500 or 5,000 for example. Be consistent. If you start something, say hosting a Twitter chat, or a blog, you need to keep it up. I view personal branding as a window into your world, so make sure the right products are on display. Be credible, authentic and reliable. These are qualities people hire you for, so ensure your interactions are polite and you take time to thank those who support and interact with you. Q: In your opinion, should companies encourage their employees to build a personal brand as thought leaders? If so, how can they do so in a non-intrusive way? Companies don’t have great ideas, people do. Your company’s reputation and image is made up of your people and the way they communicate. You could have the most amazing products for example, but if your retail workers are miserable and serve customers with scowls rather than smiles, that disconnect between what you say and what you do is evident. When companies are thinking about advocacy or thought leadership, what they should be thinking about is employee experience. How can you equip, empower and enable your employees to bring their whole selves to work, enjoy what they’re doing and choose to stay? That should be the focus, because when you have prescriptive communication, and inauthentic communication, it stands out a mile. Your customers and employees know the difference. For me it all comes down to company culture and ensuring there’s no integrity gap between what you say and do as a business. Then, and only then, can you think about amplifying what people are saying, thinking and feeling about your organisation and sharing it with the world. The words non-intrusive in your question are critical. Importantly, part of personal branding is your personal life, which companies need to recognise. An employee may be an incredible advocate for a certain type of music and write a successful blog in their personal life for example, but have no desire to be an ambassador for the transport company who pay their mortgage. And that’s ok. In every situation, you need to gauge the social maturity of an organisation, segment properly and work out why you want to encourage them to be thought leaders. Some people will be, but not in the way you’d like. And that’s ok. There are many examples of companies using social media to share what it’s like working in their organisation and give glimpses of their culture, e.g.- #lifeatloreal and #lifeatcapgemini. This will only increase and I think it’s authentic communication like those tweets and Glassdoor reviews etc. that will entice people to join a company. In making any decision about personal branding and thought leadership, you need to listen. Don’t assume you know what’s right for your organisation, take time to hear what your employees are saying and make smart decisions based on the reality of your business.